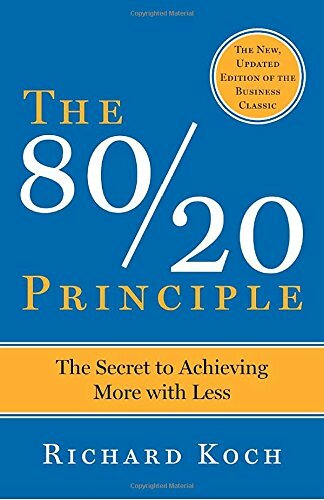 The 80/20 principle has been published in many forms including a book of that exact title by Richard Koch. The 80/20 rule was derived from the observations of 19th Century Italian economist Vilfredo Pareto, who famously noted that 80% of the land in Italy was held by 20% of the families. Pareto expanded this principle across to other countries and noted that the same rule was roughly followed everywhere and applied to the distribution of power, income, & wealth. James Clear has written a brilliant bio on the Pareto narrative. Today this ratio is often used to explain the difference between the ‘Haves’ and the ‘Have Nots’. It defines the difference between being efficient (someone who is across everything) and effective (someone who focuses on the right thing), and is used in account management to differentiate Category A, B & C clients. The same segmentation principle is the key to managing high levels of service or advice, to a small number of people, and prioritising the effective 20% above everything else. 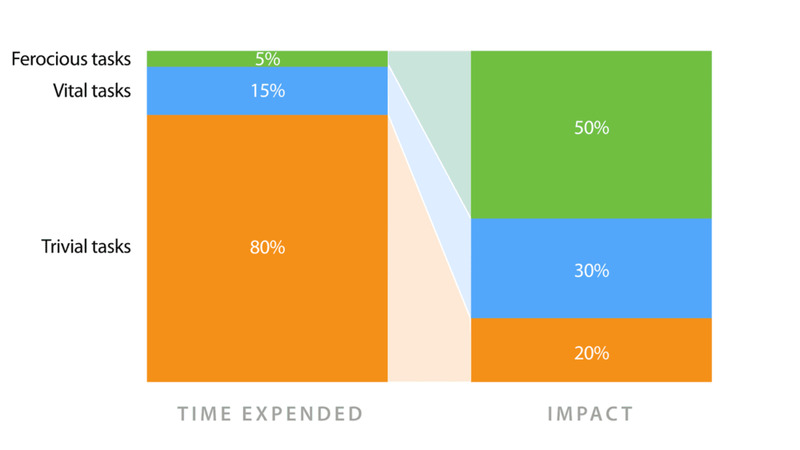 The 80/20 principle defines the difference between being efficient and effective. 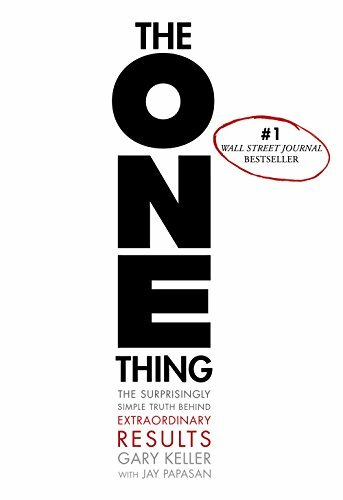 In the book The One Thing, Gary Keller asks a basic yet clarifying question: ‘What is the one thing that if you did it today, would make doing everything else redundant or unnecessary?’ Aligned with this ruthless focus, modern productivity practices support the idea that there is always a single piece of work each day that has to be done. So what if you did that first, and didn’t attempt anything else until it was done? Would you need to do the other stuff? There is always a single piece of work each day that has to be done. I believe I can process 20 tasks a day. If I’m ferocious about one task each day, this 5% will have the greatest leverage. I challenge you to find out what your one thing is each day, and at the same time get clear on the 5 things which you do that no one else can. In my world it’s Thinking, Writing, Presenting, Aligning value & Mentoring. I can run a team meeting (not sure I should); I can review the finances (not sure I could); & I can fill out a form (not sure I would). Of course this doesn’t mean that team meetings, spreadsheets and signing documents don’t get done. Just not by me. In a normal life there are tasks that must get done due to responsibilities or because you haven’t put those tasks into a system or procedure where they’re completed by someone else. It may be washing your car, cooking your meals, cleaning your house, booking your travel, paying bills. Doing the ordinary tasks is fine – until they stop you from doing the extraordinary stuff. I challenge you to find out what your one thing is each day. Extraordinary results require a ferocious commitment to the few things that only you can do. Does a surgeon order gauze, clean instruments or administer anaesthetic? Maybe you need to give yourself permission to rewrite the rules of expectation and redefine what exactly your work is. As more and more ‘tasks’ are outsourced (to cheaper labour), automated (to systems and software) or possessed (taken over by deep learning networks), I think we need more focus on what our purpose should be, attack the 5% as a priority, and explore where that can take us. Doing the ordinary tasks is fine – until they stop you from doing the extraordinary stuff. Is it arrogant, indulgent or selfish to outsource the normal? I’d say YES! But it’s also essential to find out what we’re capable of. Athletes and adventurers are some of the most selfish people on the planet. They’ve needed to be, to reach the heights that they have. The reason the Renaissance period is famously filled with masterpieces is because the Medici family provided all artists with their food, clothing, shelter and materials. This allowed the artists to focus on what they did best and paint chapels, sculpt marble and carve statues. Athletes and adventurers are some of the most selfish people on the planet. They’ve needed to be, to reach the heights that they have. Sometimes I choose to wash my own car. My son joins me, my dog chases the hose, and I get some sun on my back. And sometimes I pay someone else to wash the car so I can do something else with my time. It’s not about being better than a task at hand. It is about being intentional. Live a life by design, not default. Find the path travelled best by you and walk that often. Establish what you do, that others can't, won't or don't; and spend more time in that space. Be focused on the 20% and then be ferocious about the 5%.